In case you didn’t realize it “Fashion Week” in New York just ended. And one of the major fashions shows at the event featured the Snuggie. Yes, the Snuggie. The world’s most infamous “blankets with sleeves” is, of course, the very antithesis of anything fashionable, so most likely the Snuggie show was some sort of tongue-in-cheek publicity stunt. You can read about it from the Associated Press report. 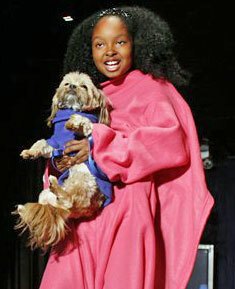 The show included not only the original Snuggie, but the new Snuggie prints, the Snuggie for Kids, and even the Snuggie for Dogs made its debut on the catwalk. So I guess the piece of trailer trash who picks up a Snuggie from Wal-mart now can convince herself that both she and her Pitbull are sporting haute couture. An even more frightening development in the Snuggie demimonde is the appearance of the Snuggie Sutra. This website, inspired by the classic work of Indian erotica the Kama Sutra, presents a series of sexual positions that couples can attempt whilst clad in a Snuggie. Did the TV commercial ever say if the Snuggie was machine washable? Never thought the Snuggie would go this far, but none the less I’m extatic for the creators! Scott Boilen has always been a marketing expert and this time he really knocked it out of the park. Way to go Scott. Can’t wait for the day they have Snuggies for golfers! Anyone else sick to death of Snuggies? Can we move on to something else? I suspect you’re already on the case, Mr. Lucas, but can you PLEASE check out the “Secret Keeper Pouch” infomercial and product? It’s pretty standard fare in terms of a 30-60 second infomercials, but the idea of the product makes me think the target audience and intended consumer–hot chicks and hip club-hoppers–won’t be buying, and the unintended audience and consumer–uncool, smoker-voiced, one-armed-bandit-pulling women getting on in years–will be. Seriously? A pouch where you store all your important cards and stuff ’em into your bra and go on your way? That’s the product they’re selling. I’m reminded of countless “broads” (as they would have been called in the television programs and movies where they were featured) receiving their tips or “payment” (yep) or other cash money and then jamming it into that dark, unknown space uh…down there. Anyway it’s a hoot. I’m sure you’ll agree. Thanks for the heads up. I’ve never seen that commercial but I’ll keep an eye out for it now.